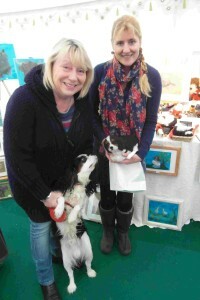 Here is a photo of Toby, the cavalier spaniel, and his owner receiving a sculpture of a cavalier created by Carol Hansen. Toby seems to like his new friend! Carol Hansen makes sculptures and pictures of pets on commission, please allow three weeks for completion. Toby the cavalier meets a cavalier sculpture made by Carol Hansen for the first time!